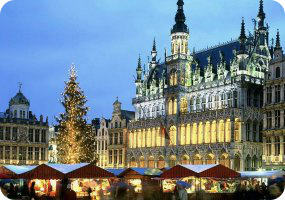 Book now the best shore excursions in Brussels and Bruges. High quality and safety at the lowest prices. If your are looking for Shore Excursion Brussels and Bruges, book now the best guided tours at lowest price with Ancora Tours. From 2003 we offer you official guides in english, transportation and travel insurance, all included. The highest quality at the lowest rates. Our shore excursion in Brussels takes in all the main attractions of the Belgium capital, home of the European Parliament. First experience the modern personality of Brussels and glimpse into the city’s history. Then we’ll make the short journey to Bruges to discover more of Belgium. Extra Fees: Church of Our Lady admission: €4 per person. What’s eating: Pommes frites with hot, fresh mussels is the classic Belgian meal. Souvenir: A beautifully-wrapped box of Belgium chocs are sure to please those back home. With our Brussels shore excursion, you’ll experience not just the modern character of Brussels, but the charm and history of Bruges too. First, from the port of Zeebrugge we’ll make the one hour and forty minute journey to Brussels. Once there, our coach will take you on a panoramic tour of the city. First stop is the Atomium, a giant sculpture in the shape of the iron atom magnified 165 billion times. Created in 1958, this unusual monument stands 102 metres high and weighs a whopping 2400 tons. An unforgettable and futuristic introduction to the city, CNN named this attraction Europe’s Most Bizarre Building. Be sure to take an Instagram-worthy photo! Next, our Brussels shore excursion will have a change of pace at the Royal Castle of Laeken, offical residence of the Belgium monarchy. Situated in the grounds of this Louis XVI style palace are the Royal Greenhouses of Laeken, a Japanese Tower and an impressive Chinese Pavillion. In the second part of this shore excursion we’ll stop in the medieval city of Bruges. There’s lots to see and do here so our guide will lead you through the cobbled streets. We’ll visit the Church of Our Lady, Burg Square and the fourteenth century town hall, Stadhuis. After St. Salvator’s Cathedral, you’ll be able to catch your breath at Grote Market and absorb the character of the spectacular buildings which surround you. An enchanting end to our Belgium tour.